"You never look at things for what they are." 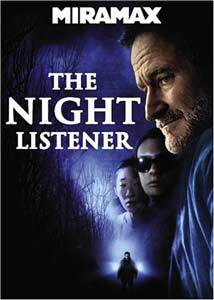 Based on writer Armistead Maupin's semi-autobiographical work, the film version of The Night Listener is one of those odd stories that seems to work better the less you know about going in. It also is a tough film to properly categorize, because even with back cover boldface type promising "unpredictable twists" and "edge of your seat" thrills, what director Patrick Stettner (The Business of Strangers) smartly lays out in just 80 minutes is almost like a slow-motion anti-thriller. Better yet, it works as more of an intelligent dramatic mystery�with a screenplay written in part by Maupin and former partner Terry Anderson�that is able to blend equal parts of ambiguity and misdirection into the mix. Robin Williams is Gabriel Noone, a late-night radio host/writer in New York whose agent (Joe Morton) gives him a hot "over the transom" autobiography to read, written by a troubled fourteen-year-old boy (Rory Culkin) as a form of therapy. In the Dickensonian book called The Blacking Factory, the AIDS-ravaged boy recounts his days of horrific sexual abuse at the hands of his parents and others, and after a series of phone calls with the young author, personal events force Noone to track him down at the Wisconsin home of social worker/caregiver Donna Logand (Toni Collette). And that journey is exactly where the concept of reality, self-doubt, and imagination begin to fuse together in the narrative, folding in a number of interesting directions and permutations as Williams' Noone continues to pursue the enigmatic teenaged author even as his own personal life is crumbling around him. The fact that Noone is homosexual is portrayed in a casually open but understated way, and his failing relationship with the much younger Jess (Bobby Cannavale) is just that, a once comfortable situation that has naturally and irrevocably soured. The strangle angles of the story makes this a nice counterbalance to all of those cookie-cutter thrillers that rely heavily on loud music stingers and grandiose action sequences, and Stettner is able to tell this one at an almost casual pace, albeit a dark and shadowy one. And all that stylish atmosphere is certainly important for the genre, but Toni Collette runs rings around everyone and everything with a performance that pushes the actress to all manner of dramatic extremes. She is really something to watch here, and she gives Stettner a set of rich human textures to showcase. The Night Listener is not exactly "Hitchockian" like the back cover promises, a label that seems unfair to burden any film with, whether it's true or not. What it is, however, is an unusual and compelling drama that gently pulls back when you expect it to lurch forward. Image Transfer Review: Issued in 1.85:1 anamorphic widescreen, The Night Listener transfer carries its thematic darkness pretty well with black levels that never become unnecessarily muddy. There are quite a few poorly lit rooms going here, yet there was never any sensation of soft, blended edges; fleshtones appear natural and rather golden during some scenes, and intentionally muted with colder hues during others. The print itself is very clean, and aside from some very moderate shimmer, there are no distracting instances of compression issues or artifacting. Audio Transfer Review: Only one audio option, and it is Dolby Digital 5.1 surround. Not especially bad, but it is kind of inconsistent, with voice quality ranging from mostly very clear to every once in awhile coming across a little flat. On the plus side there are a few sequences where there are some nice swirling effects that move around from front to back, as well some strong .LFE activity early on. However, this is a very quiet film for the most part, and the presentation works more often than it doesn't. Extras Review: No commentary track for this release, with the only major supplement being the short The Night Listener Revealed (11m:40s). The focus here is on writers Armistead Maupin and Terry Anderson, and how their personal life and this particular chapter of it came to be, lending credence to the "based on true events" label. Robin Williams contributes a few comments here and there, but it's mostly Maupin and Anderson intercut with scenes from the film. The complete absence of director Patrick Stettner in this piece (as well as the lack of a commentary) makes me wonder if there wasn't some creative falling out along the way somewhere. Stettner's only appearance is a :37s intro for the one deleted scene (03m:11s) offered here. The odd thing about the intro is how confident Stettner was that this scene needed to be cut, at one pointing referring to it as "our mistake," so there was really very little motivation to even want to sit through it. The clip is presented with no formal soundwork, so there is no music or complete sound effect cues. There's a set of seven trailers, including The Prestige and Renaissance�plus one for Blu-Ray. The disc is cut into 16 chapters, with optional subtitles in English, French or Spanish. After watching this I found myself occasionally thinking about it the next day�in a mix of plot points and especially Toni Collette's highly charged performance�so on some very base level that probably says something about its merits. This isn't really the "edge of your seat" thriller the back cover promises, but it is a very intriguing story that moves around in a few unexpected directions along the way, and the less you know about the plot particulars the better.